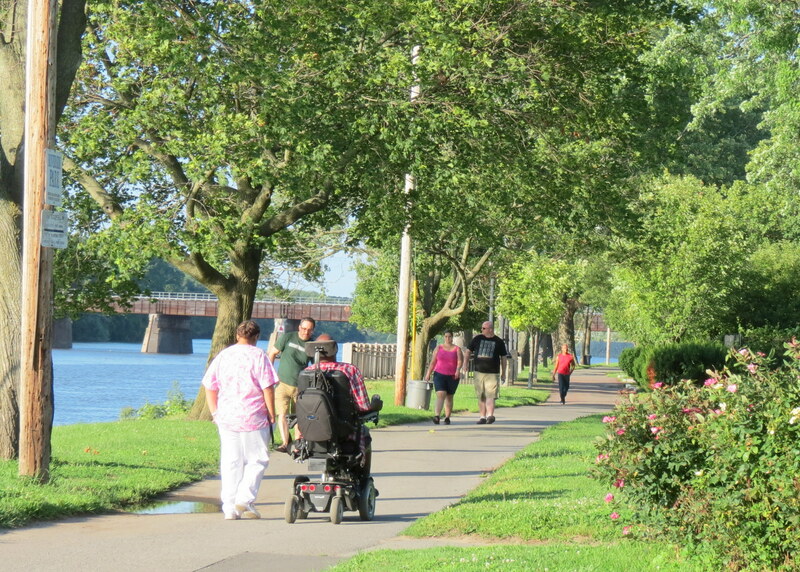 Last night (June 21), the County held a Public Meeting at the Central Library unveiling its Bike Trail Extension Feasibility Study on linking the existing segments of the ALCO Heritage trail along the Mohawk River to Riverside Park and the Stockade neighborhood. Currently, the riverbank trail ends at River Street, along the East Front Street neighborhood. The meeting was hosted by Ray Gillen, who is the head of County Economic Development and Planning and the chair of Metroplex, and by Gregg Urspring, a representative of the engineering firm performing the Study. 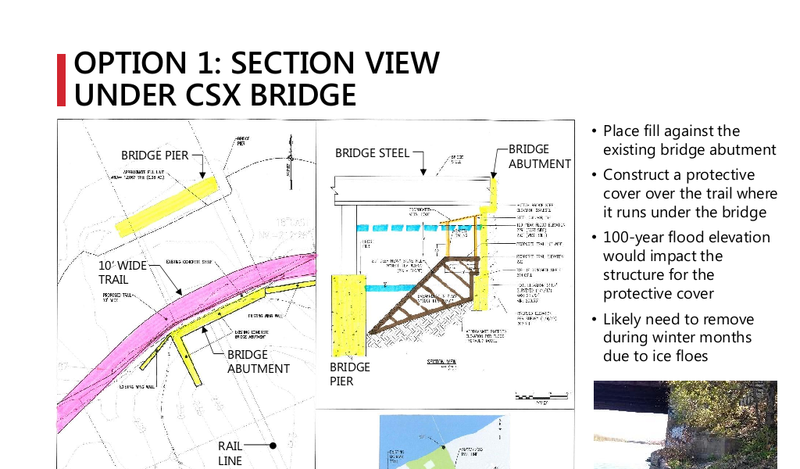 OPTION 1: Under the CSX Bridge: Trail would run under the existing CSX/Amtrak Bridge, with two alternative alighnments (a steeper one with an 11% slope and one with an 8% slope). It would require placing fill against the existing bridge abutmenmt, out to the first pier; constructing a protective cover over the trail where it runs under the bridge; removal is likely to be needed during winter months due to ice floes. 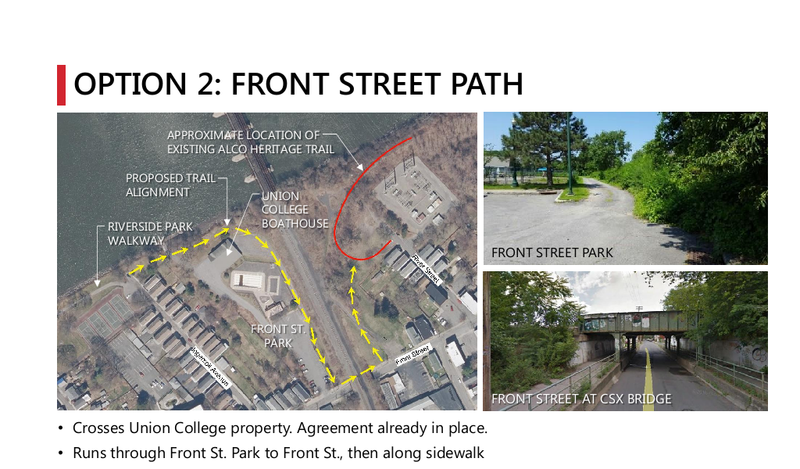 OPTION 2: Front Street Path: It would start at the “Riverside Park Walkway”, cross Union College property (with an Agreement already in place), run through Front St. Park, then along a sidewalk on Front St. and through either CSX railroad or vacant property to the existing ALCO Heritage Trail. There was no final attempt to reach a consensus at the Meeting between Options 1 and 2. More thoughtful evaluation will be possible when the Study is online. 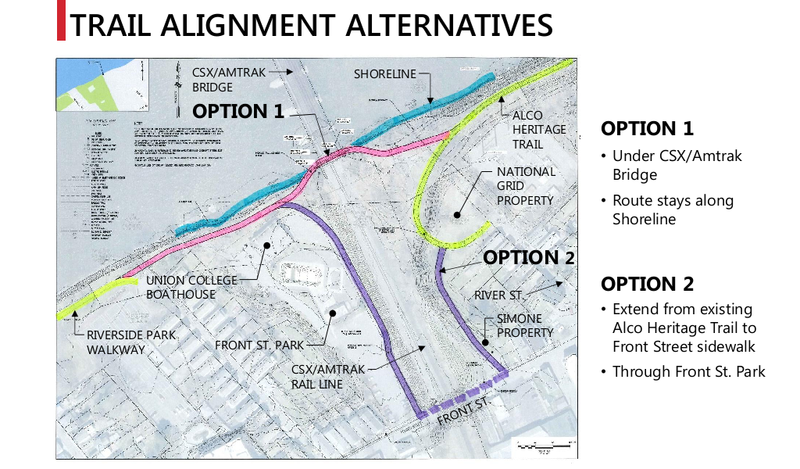 At this point, I personally am leaning toward Option 2, given the significant problems raised by placing a segment of the trail under the bridge, with worries about floods and ice floes, and seasonal closings. I still want a chance to read the Study before coming to a final conclusion. See Stephen Williams’ report on last night’s meeting here in the Gazette. Here are images from the Study slideshow that help illustrate the points above. 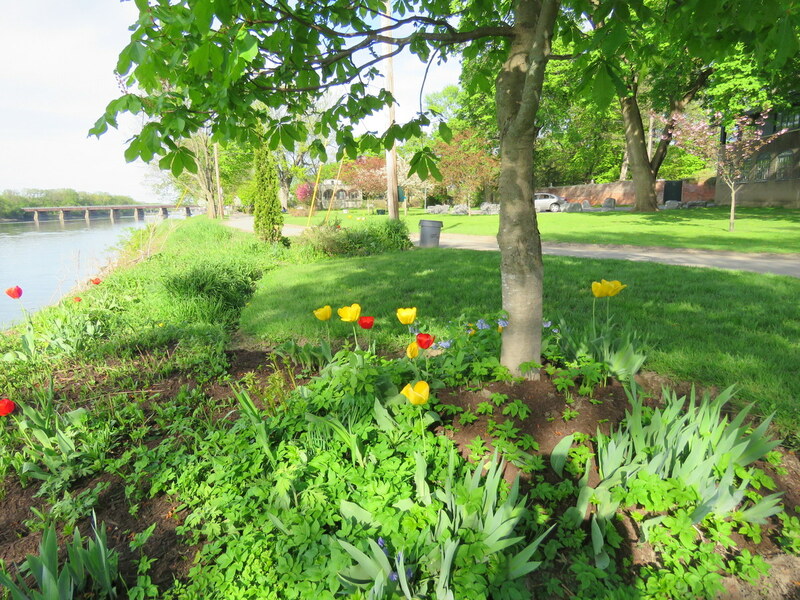 Readers of this website know that I am an avid user and strong admirer of Riverside Park (as a mellow and beautiful experience and a photography subject, in fair weather and foul). From the first declarations that Riverside Park would be getting a shared use path — one path for both pedestrians and bicyclists, going in both directions — I have voiced and posted concerns that increased numbers of bicycles, many going at fast speeds, would ruin the Riverside Park experience, for many current users, by creating a “scared use” path. The response from Bike Schenectady proponents has consistently been that they will assure that a shared-use path meets engineering requirements, not that the shared-use notion might be abandoned. Therefore, acknowledgment in the Feasibility Study and at the Public Meeting that there must be strong consideration to having separate paths for pedestrians and cyclists, in order for a Bike-Ped Trail to be safe and workable, is a positive outcome. 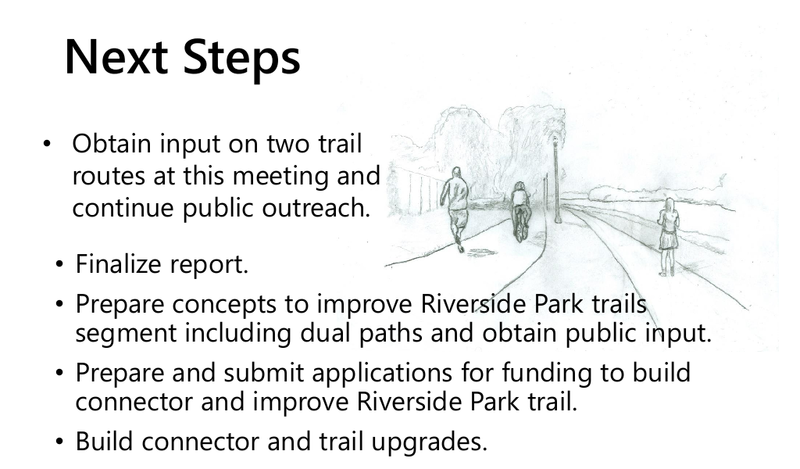 Note that Option Two in the Feasibility Study shows that trail proponents realize we can have a successful Trail without the need to hug the riverbank wherever possible. As further information or insights arrive, I will update or follow-up this posting. USERS Walking and biking trails serve the greatest diversity of users: pedestrians, including those with fitness and balance limitations; cyclists, particularly those using road bikes; scooters; skateboards; rollerbladers; wheelchairs; and electronic mobility devices used by persons who need assistance to be mobile. People of all ages walk, run, ride, and roll to enjoy the environment, socialize, exercise, and access other parts of the community. Since user speeds can vary substantially, this trail type requires extra courtesy in sharing the trail. Jessie Malecki born and living on North St. over 90 years; five houses away from the park.